If you enjoy classic movies then you will enjoy TCM. However, access to its online Watch TCM service is blocked outside the US. We’ll show you how to unblock this service outside of the US with a VPN if you are abroad. We’ll also highlight the best VPN providers for doing so. TCM mainly shows films released in the 80’s and earlier, with the occasional airing of newer films. 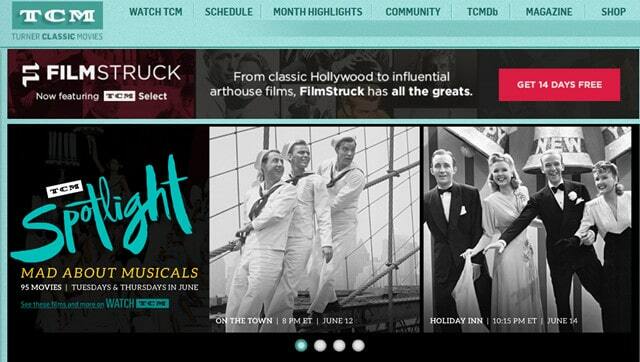 If you enjoy classic movies, then TCM is worth checking out. If you have a cable subscription and are located in the US, then accessing TCM online through its Watch TCM service will be no problem for you. However, access is blocked outside of the US. One of the most reliable options for accessing the service is connecting to a US Virtual Private Network (VPN) server. VPNs let you reroute your internet connection through a server of your choice, and encrypt your internet traffic in the process. VPNs usually have servers located in numerous locations worldwide, including in the US. As such, you can watch geo-locked content from sources like TCM in Canada, the UK, Germany, or anywhere else abroad. This means that other services like BBC iPlayer, Sky Go, and Comedy Central can also be unblocked by connecting to a VPN server in their designated locations. A good VPN is clearly a powerful tool but not all VPNs are on the same level. We have studied several VPNs in order to determine which ones work best for unblocking TCM outside of the US. ExpressVPN The one to beat. Unblocks TCM and most of the popular streaming networks from almost anywhere. Great streaming speeds, top-notch privacy and security and easy to use apps. Includes 30-days money back guarantee. NordVPN Huge network of servers is great for accessing most geo-blocked streaming content. Speeds, privacy, and security are solid. CyberGhost Budget network provider with some of the best streaming speeds we have come across. Beginner friendly apps. PrivateVPN Newest provider on this list with a small yet growing network. Servers are fast and great for streaming. IPVanish Reliable connections and good streaming speeds. Unblocks TCM but look elsewhere if you also want Netflix or Hulu. ExpressVPN secures your connection while facilitating HD streaming. 29 servers located in the US allow for the unblocking of TCM as well as other services such as Amazon Prime Video. Three simultaneous connections are allowed per account. This provider has strong security measures in place to protect its users. Traffic is encrypted using the 256-bit AES protocol, IPv6 leaks are blocked, and a killswitch is in place. The latter kills your internet connection in the event that the connection to a VPN server drops. This means that no data is leaked to your Internet Service Provider (ISP). In addition, a .onion site is available which allows for almost completely anonymous registration. Connection logs are stored with ExpressVPN, but the amount of data retained is minimal and no IP addresses are stored. Bitcoin payments are accepted which help to keep payment information anonymous. You can access customer support via 24/7 live chat, or you can use a wide variety of tutorials, troubleshooting guides, and FAQs. This ensures that users are not at a loss when they are in need of assistance with the service. ExpressVPN has native apps available for MacOS, Windows, iOS, Android, Linux, and some routers. Chrome, Firefox, and Safari extensions can be downloaded, and enable you to control the VPN app from your browser. For devices that don’t have native apps, ExpressVPN provides guides that let you manually configure a VPN connection without the need for an app. BEST VPN FOR TCM:ExpressVPN is our #1 Choice. A blazing fast and reliable choice. Great at unblocking all major geo-restricted streaming services. Top privacy features and keeps no logs. Try it risk-free with the 30-day money back guarantee. NordVPN secures your connection while offering more than 1,700 US servers. This means that there will be no issues connecting to a VPN server which unblocks TCM. Netflix, Hulu, and ABC can be unblocked with this provider as well. For those sharing a VPN account, six simultaneous connections are allowed, which means that an entire household can secure their internet connection using a single NordVPN subscription. 256-bit AES encryption is employed to secure your connection. In addition, DNS leak protection and an internet killswitch are provided to prevent data from being inadvertently exposed. Bitcoin payments are accepted and offer increased anonymity compared to regular payment methods. A large database of guides, tutorials, and FAQs can help with any issues you may encounter using NordVPN. If this is not enough, there is 24/7 live chat or email support available. Apps can be downloaded for MacOS, iOS, Android, and Windows. Chrome and Firefox extensions are also provided. Manual configuration is possible for devices that don’t have a native app. BEST BUDGET VPN:NordVPN is a good value choice. A great value option which works reliably with TCM and most popular streaming sites. Connects up to 6 devices simultaneously. App doesn’t offer server switching choice. 30-day money back guarantee. CyberGhost is an excellent option for fast streaming speeds and security. 700+ US servers are available, which allow for TCM to be unblocked without any qualms. Amazon Prime Video and Netflix can be unblocked too. Up to five simultaneous connections are allowed for multi-user convenience. This provider has a no-logs policy in place and connections are encrypted using the 256-bit AES standard. Furthermore, DNS and IPv6 leak protection and an automatic kill switch are in place to prevent your data from being leaked. Bitcoin payments are accepted which means that payment information cannot be easily traced back to you. CyberGhost offers a large quantity of guides, troubleshooting pages, and FAQs in order to assist users who need help, with 24/7 live chat support available to users who need more one-on-one assistance. CyberGhost VPN can be downloaded on Windows, MacOS, iOS, and Android. Manual configuration is possible with Linux and some routers. GREAT VALUE:CyberGhost is easy to use. A well priced solid performer. Good at unblocking TCM and even Amazon Prime but can struggle with other streaming sites. Comes with a 45-day money back guarantee. PrivateVPN offers ten US servers and is a useful tool for securing your internet connection. It can unblock TCM and other services like Netflix, Amazon Prime Video, and BBC iPlayer. Five simultaneous connections are allowed, which gives users the freedom to use all of their devices with just one subscription. No logs are stored and 256-bit AES encryption secures your internet connection. IPv6 and DNS leak protection are standard. These measures increase the security of your connection by stopping data from being leaked to your ISP. Bitcoin payments are accepted, which helps to keep your transactions as anonymous as possible. PrivateVPN provides customer support through its live chat service. Remote control support is offered to assist customers with troubleshooting and setup of the VPN. FAQs are freely available for users who still need some additional assistance. Dedicated apps for Windows, iOS, MacOS, and Android are available. Manual configuration is possible with supported wireless routers and Linux systems. GREAT SPEED:PrivateVPN is a good family choice. Unblocks TCM and allows up to 6 devices on the same account. Similar yet cheaper offerings higher on this list. 30-day money back guarantee. IPVanish provides access to more than 600 US servers. This means that TCM can be accessed securely, along with other services like Comedy Central and Hulu which are geolocked to the US. This provider allows for a whopping 10 simultaneous connections, the most of any service on our list by far. 256-bit AES encryption secures your connection when using this service, and DNS leak protection is built in along with a killswitch. Bitcoin payments are accepted, which allows for secure payments which are virtually anonymous. 24/7 customer support is provided through an email form. Apps are available for Windows, MacOS, iOS, Fire TV, and Android, as well as some supported routers. Other routers and Chromebooks will require manual setup. UP TO 10 DEVICES:IPVanish is great for families and multiple connections. Unblocks TCM but can’t unblock as many streaming services as rivals higher on this list. Not the cheapest option. 7-day money-back guarantee. Will a free VPN work with TCM? There are certainly plenty of free VPN services out there. However, we generally don’t recommend using them for a few reasons. Free VPNs sometimes carry malware and in many cases are slow due to many individuals using the service at once. In addition, these services use unscrupulous practices in many cases to make money, such as keeping logs of your activity and placing ads in your browser. Additionally, they usually have a smaller number of servers to choose from and your data is typically capped. It’s definitely worth shelling out a few bucks a month to go with a reputable provider. If you try to watch TCM outside of the US, you will be presented with a popup asking you to sign in with your TV service provider. But even if you have a subscription, you won’t be able to access the service unless you are in the US, or have a US IP address. 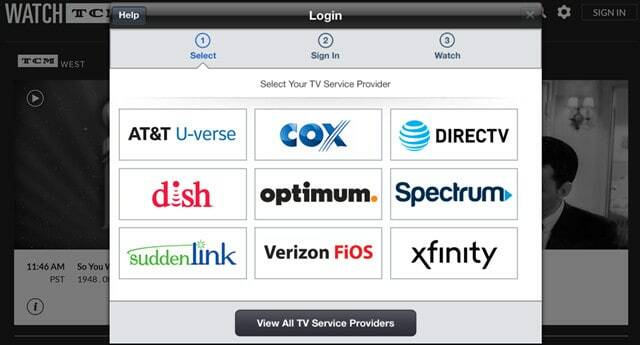 In order to enjoy TCM outside of the US, first connect to a US VPN server and then log in with your TV service provider. You will then be able to enjoy your favorite classic movies. What movies are available to watch on TCM? While watching TCM, your movies will be uninterrupted by ads so you can enjoy them to the fullest. TCM will only run ads of their own products and services between movies. Titles such as Dr. Jekyll and Mr. Hyde (1932), The Best Years of Our Lives (1946), and King & Country (1964) are sometimes broadcast on TCM. More recent movies like Eyes of Laura Mars (1978), He Knows You’re Alone (1980), and Scenes From the Class Struggle in Beverly Hills (1989) are also available to watch.